I’m very blonde. I am not talking about L’Oreal Preference shade 92 natural blonde (much to the dismay of my hairdresser, that box does get purchased from time to time – and used – usually when I am bored). I am speaking about the fact that I will oftentimes neglect to purchase the main ingredient of a meal or something that is at the least, integral, to a dish. These were supposed to be pork pot stickers, but I came home with everything but the pork. I can’t tell you the amount of times I pay at the cashier and as I’m wheeling out of the store, realize I didn’t buy the fish for the tacos, or for that matter the tacos. So I am THAT woman, with a cart full of bagged groceries, heading back to get what I forgot, worrying that people think I’m shoplifting tilapia. My husband just shakes his head when I tell him. I could even have the list with me, and if I don’t write it in the way I shop the aisles, you can kiss something on the list good-bye. We have just learned to live with the occasional menu change or the task of going through the cashier line twice. I was really looking forward to making these because it is something the kids like too, so I had to improvise – no going back to the store. Not too hard to do with a dumpling actually, so I was in the clear….this time. I have made a variety of dumplings and if you are sitting there, folding up 30+ little guys, the last thing you want to see is them coming unsealed in the pan. Make sure you don’t skimp on the water and that you seal the edges well. 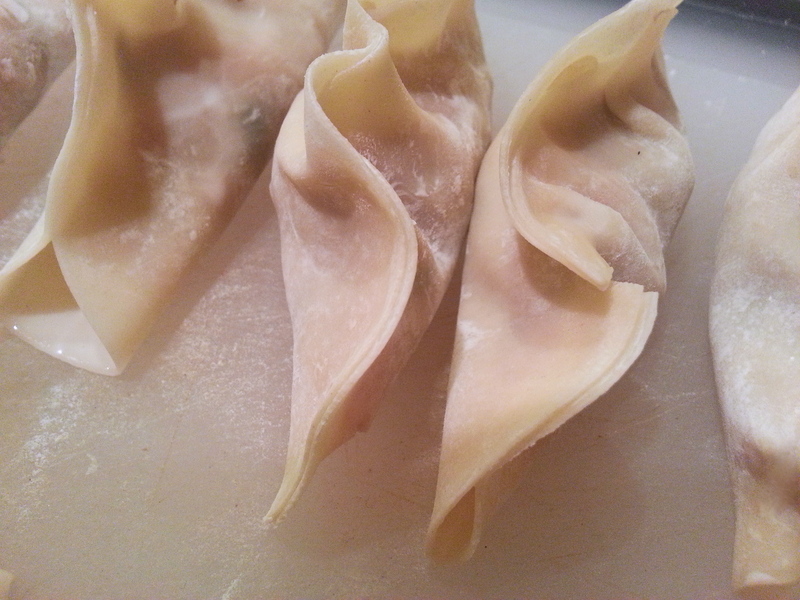 I decided to try the gyoza skins because they are round, and found that they were easier to fold up and crimp than the square wonton wrappers. These came out perfectly, and tasted great even without the fatty pork. I did make the mistake of storing extra pot stickers in a glass container without considering the fact that they would stick to one another and make one giant dumpling. So with the mini victories come the defeats. I dealt with it and moved on. Heat a large non-stick pan over medium-high heat. Add a tablespoon of peanut oil. Add in the two kinds of mushrooms and cook until mushrooms are softened, about 4 minutes. Add 2 TB of the soy sauce and 1 tsp of the sesame oil, cook for 30 seconds. 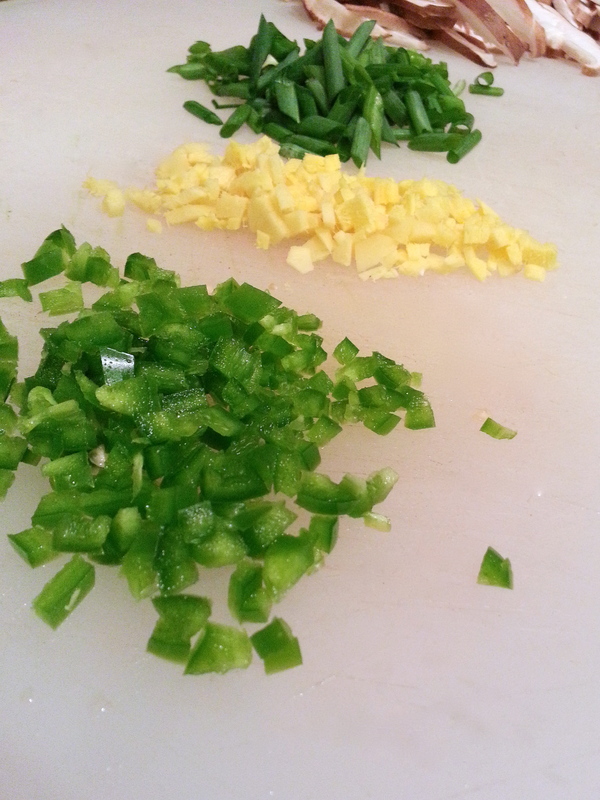 Add onions, garlic, ginger and jalapeño and cook for another 2 minutes until flavors combine. 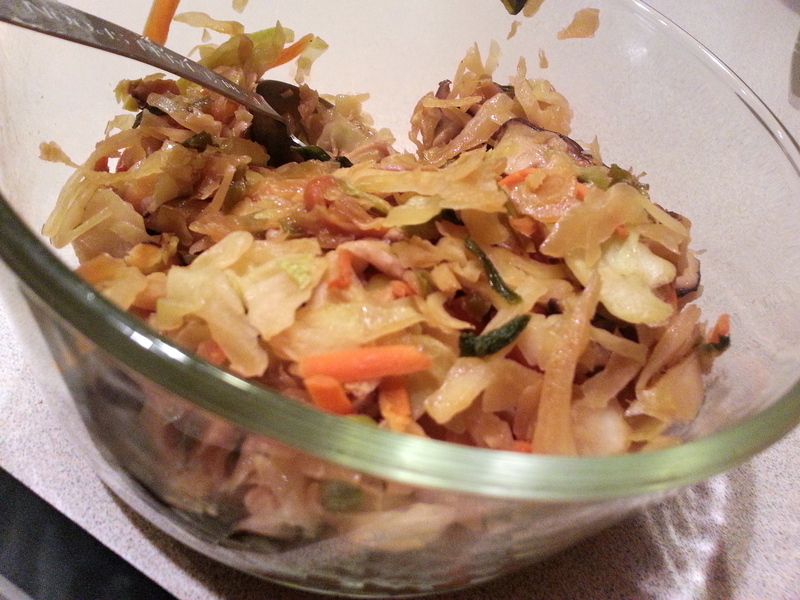 Stir in coleslaw and cook for 2 minutes until cabbage wilts, stirring frequently. Taste mixture and add in remaining soy sauce and sesame oil if needed. Remove from heat and cool slightly. While mixture cools, combine ingredients for the dipping sauce, stirring well with a whisk. Working with one gyoza skin at a time (cover remaining with a damp towel to prevent drying), lay out 8-10 skins on your board. Spoon 1 TB mushroom mixture in the center of each skin. Moisten edges of the skins with water. Fold in half, pinching and edges to seal. Heat peanut oil in the same large non-stick pan over medium heat. 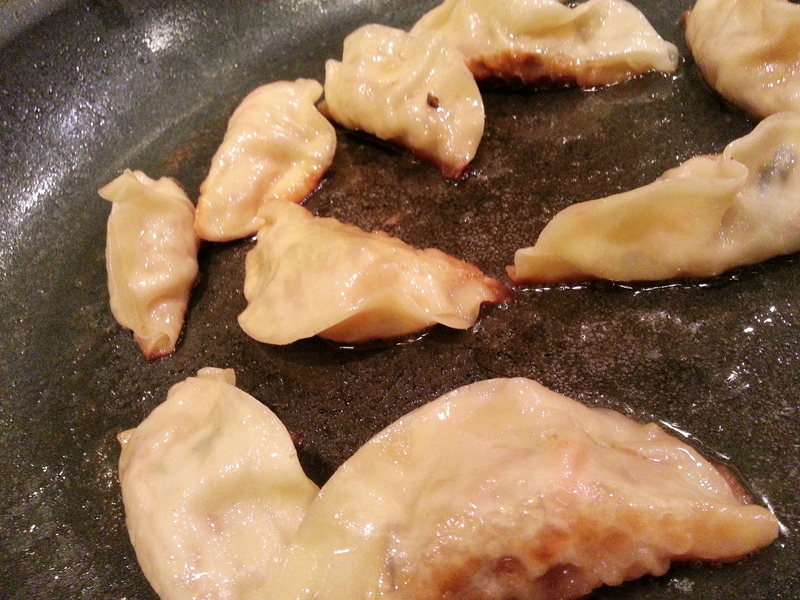 Arrange pot stickers in the pan in a single layer. Cook 2 minutes or until browned on the bottom (or a side). Add one cup of water to the pan and cover. Continue to cook the pot stickers another 4 minutes. Uncover and cook until liquid evaporates, about 2 minutes. 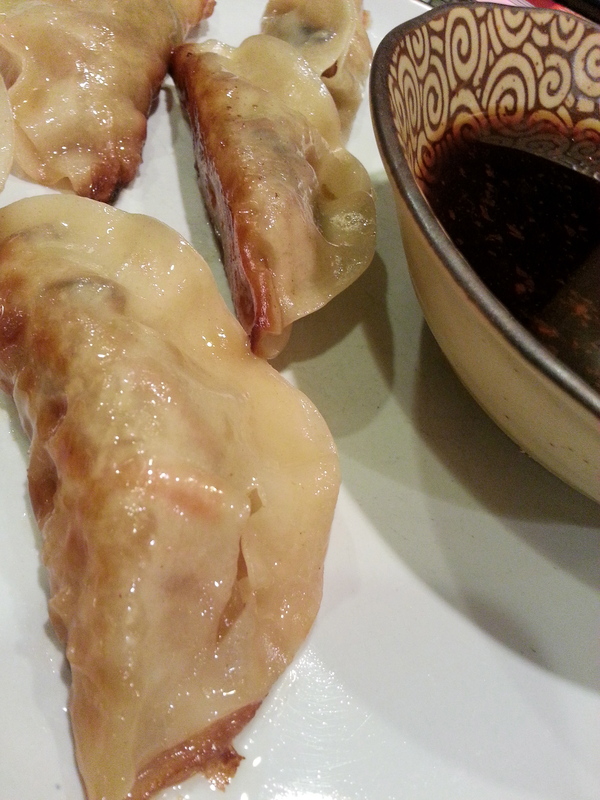 Place dumplings on a plate and cover to keep moist and warm. Continue making the remaining dumplings. Serve these immediately with dipping sauce…..and hot chili sauce of course! 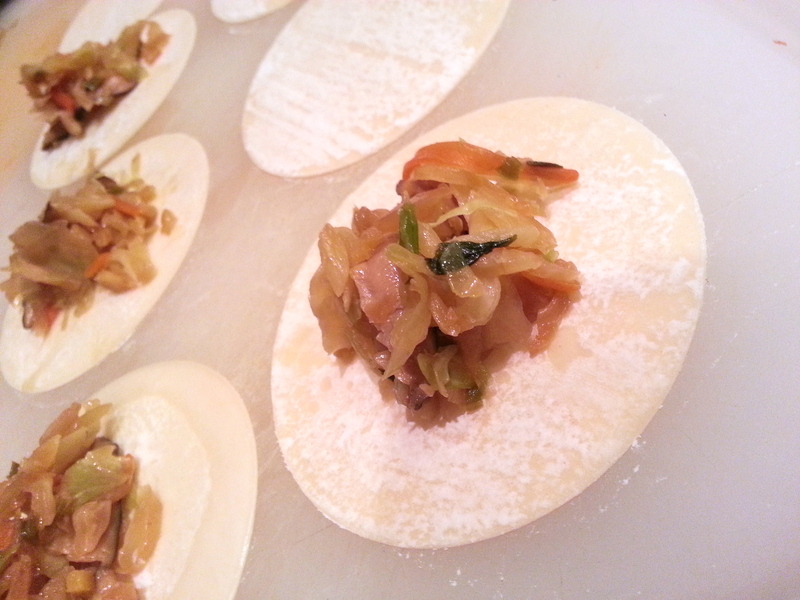 This entry was posted in appetizers, main dish, veggie and tagged dumpling, mushrooms, pot stickers, shiitake, veggie. Bookmark the permalink. Were you inspired by a beloved Asian friend?